Cozy Ranch in Beautiful Willa Chase Subdivision! Rocking Chair Front Porch, Cathedral Ceiling in Spacious Living Room, Gas Log Fireplace. Spacious Kitchen with Pantry. Separate Formal Dining Room Features Beautiful Hardwoods. Master Ensuite Includes Double Walk-In Closets With Plenty of Shelving. HUGE Fenced Back Yard with Deck For Grilling and Fire pit. NEW Carpet Throughout! Minutes from I-40 and I-95. South Johnston High School District. Move-In Ready! Must See! Directions:From I-440 East, take Exit 325. Take a left onto Hwy 242. Right onto Gilbert Street, Cross over Hwy 301 into Willa Chase Subdivision. Left at stop sign, home on left. SchoolsClick map icons below to view information for schools near 103 Hunterwood Place Benson, NC 27504. 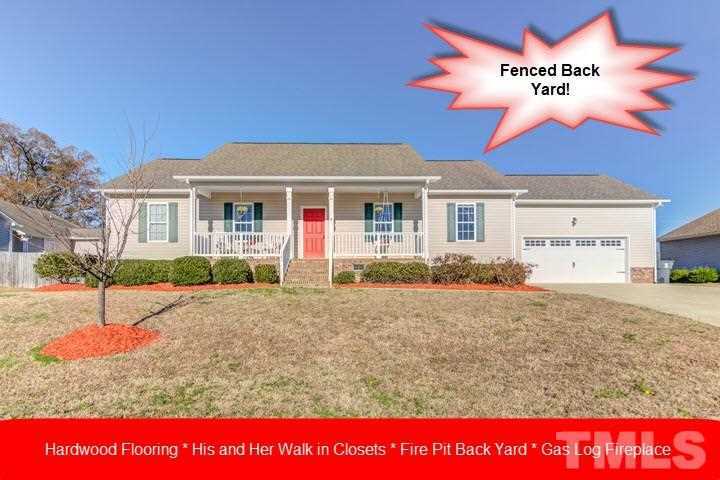 Home for sale at 103 Hunterwood Place Benson, NC 27504. Description: The home at 103 Hunterwood Place Benson, NC 27504 with the MLS Number 2226881 is currently listed at $178,000 and has been on the Benson market for 121 days. You are viewing the MLS property details of the home for sale at 103 Hunterwood Place Benson, NC 27504, which is located in the Willa Chase subdivision, includes 3 bedrooms and 2 bathrooms, and has approximately 1643 sq.ft. of living area.